We are now firmly in tornado season. This unofficial weather season started April 4th, and we’ve already see a few storm system move through, causing various levels of damage. Cool, dry air masses clash with warmer, moist air masses that are moving north from the Gulf Coast and the results are storms, which can easily be triggered into becoming violent storms. All the trigger a system needs is some afternoon surface heating to set off an evening, or a whole night, of a line of storms or isolated storm cells that march eastward across Tennessee. These storms can bring strong straight line winds, torrential rains, hail, and tornados. In this week’s blog, we’ll take a closer look at winds and the damage they can cause to a roof. If you need the best local roofer in the Nashville, Old Hickory, Goodlettsville, and Hendersonville area, call Tim Leeper Roofing. Tim Leeper is Nashville’s Top Rated Local® Roofer and the one to call for all roofing services including estimates, repairs, and replacement. The management and staff of Tim Leeper Roofing pride themselves on the high quality of work they deliver and that they do so with the best customer service around. When a line of strong spring storms moves through an area, it’s leading edge can contain strong winds known as straight line winds. Straight line winds are caused by a downdraft from a storm cell and can reach up to 100 miles per hours. Because these winds are, so to speak, dropping out of the strong storm cell, they reach the ground and radiate out in all directions. The force of these winds frequently causes damage that is distinguishable from tornado only by meteorology experts. These downdrafts are also known as microbursts and, when they are especially long lived, Derechos. The wind bursts can stretch out for over 250 miles from their point of origin. The Derecho of June 29th, 2012, traveled 700 miles, from Iowa to the East Coast and killed at least 20 people and caused millions of dollars worth of property damage. The damage that these winds can cause can vary from thrown debris and yard items to bringing down powerlines and trees. Roofs of houses are also often damaged. Loose shingles can be sent flying, while others shingles stay in place but have been loosened to the point where they now allow water to seep in between the shingles and reach the underlayers. 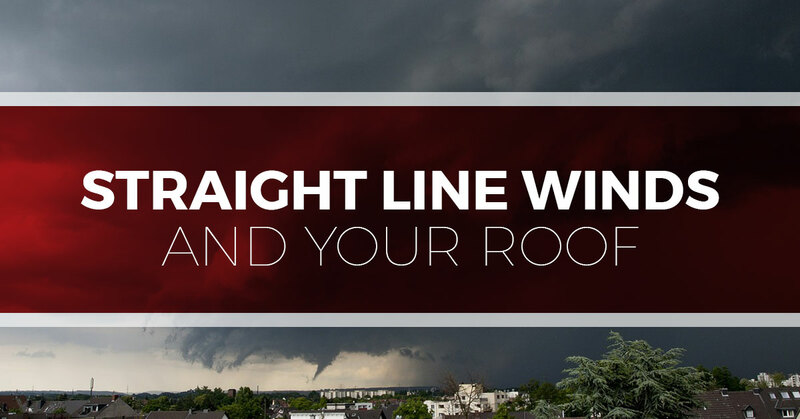 If your home has endured straight lines winds, it may have been damaged. It is a good idea, once it is safe to go outside, to inspect your roof from the ground. Do you see any missing shingles? The wind often blows shingles completely off the roof. Is there any flashing missing? Flashing is the metal trim around the edges of your roof, eaves and at the base of chimneys. Look at the edges of your roof. Strong winds will find any weak point along the edges of your roof, and the driving winds can get up under shingles. Is the line smooth, or do some of the shingles looked displaced? Check for fallen branches and for trees or power lines that may have fallen onto the roof. If a large branch has fallen on your home, there is a probability of some roofing damage. A tree limb can damage the shingles and, of course, if it falls with enough force can puncture your roof, and substantial repairs will need to be done. If you suspect that your roof has sustained wind damage from a storm, or another source, be sure to call Tim Leeper Roofing for an estimate on the damage so you can get your roof repaired quickly.